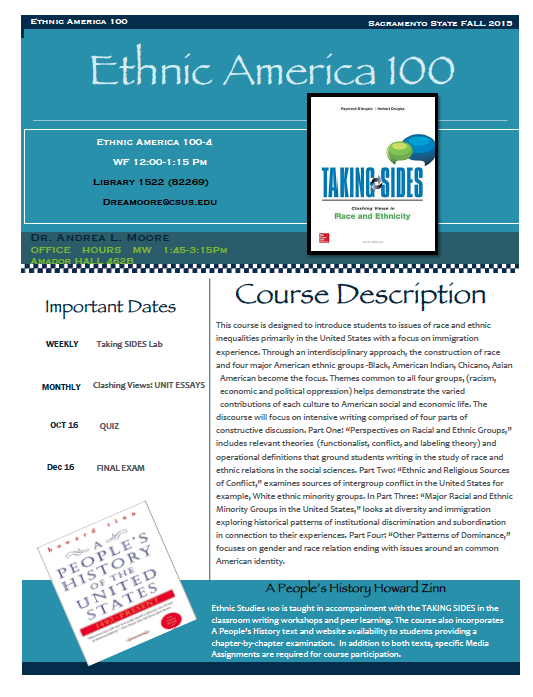 Dr. Andrea L. S. Moore is an Assistant Professor in the Ethnic Studies Department. She received her B.A. in Sociology and Ph.D. in Cultural Studies from the University of California, Davis. Her academic brand focuses on Ethnic History and Socio-Cultural Production. Her areas of expertise are situated within Pan African History, Cultural Studies, Sociology, and Popular Culture. Moore has over 10 years of teaching experience in higher education working with the Department for Behavioral Social Sciences at Sacramento City College, and the African American and African Studies Department at the University of California, Davis. Her recent scholarship is focused on extrapolating components of her dissertation that examined historical moments taking place during the Hyphy Movement. Moore looks at the Bay Area’s legacy as an epicenter for social movements, from the 1960’s Black Power Movement to the #BlackLivesMatter Movement. 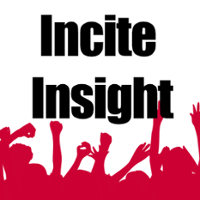 Moore explores the ways in which hip hop promotes awareness about the recent social protests movements and organizations advocating for police reform. Working with the Black Lives Matter Sacramento Chapter, Moore is examining racial frameworks found in scholarship, social media and cultural practices that investigate the social discourse of the modern era used to justify the lynching of the Black body and its connection to the current criminal pathologizing of Black people murdered in the United States. Moore is in strong support of historical institutions that provide community service in academic settings. As a self-proclaimed “product of the inner city,” Moore attributes growing up in Richmond and Oakland, California during her adolescent years as instrumental in her academic success. She has worked for and implemented grass-root organizations such as the Amandela Project in Richmond, California as an Evaluation Site Manager for Philiber Research Associates, which was part of a Teen Pregnancy Initiative, funded by the California Wellness Foundation. Moore is also an alumni member of AmeriCorps where she worked with the Bay Area Youth Agency Consortium (BAYAC) organization providing national direct service to over 40 organizations that work with high-risk communities in need. Moore has always served communities while earning an education. 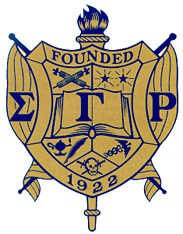 As an undergrad she joined Sigma Gamma Rho Sorority Incorporated. She also became a member the Ronald E. McNair Post Baccalaureate Achievement Program and now serves as a faculty mentor assisting students with conducting research. Moore concurrently is serving as Advisory Board member for The Cooper-Woodson College Enhancement Program which is focused on leadership, scholarship, and service at Sacramento State, Moore continues to promote exceptional education for students while building community bridges developing pathways9 for others to follow. 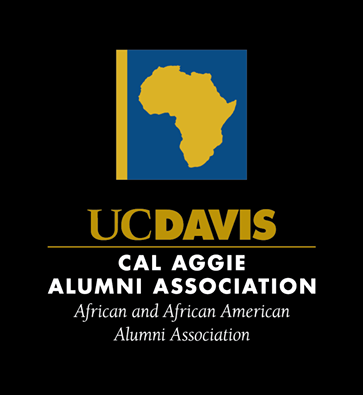 Dr. Andrea Moore has also served an an academic liasion between California State University Sacramento and the Back Lives Matter Sacramento Chapter (BLMS). Her efforts have led to CSUS support from Ethnic Studies and The Community Engagement Center (CEC) which now has a groundbreaking community collaborative partnership with BLMS. Dr. Moore's "Protests in Hip Hop" course is a service learning course in which students dedicate their service giving back to Black Lives Matter Sacramento. 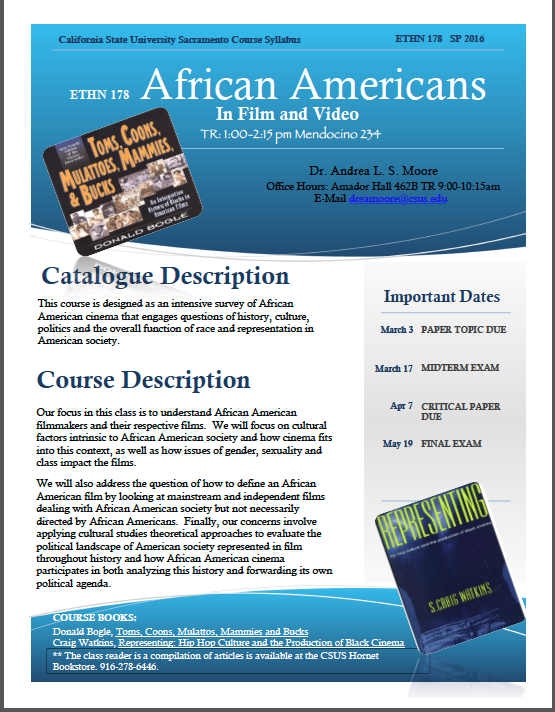 This course is designed as an intensive survey of African American cinema that engages questions of history, culture, politics and the overall function of race and representation in American society. Our focus in this class is to understand African American filmmakers and their respective films. We will focus on cultural factors intrinsic to African American society and how cinema fits into this context, as well as how issues of gender, sexuality and class impact the films. 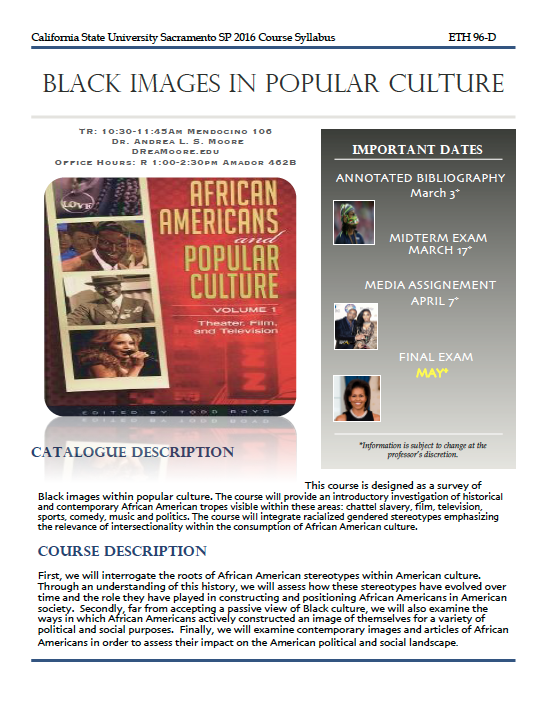 This course is designed as a survey of Black images within popular curlture. 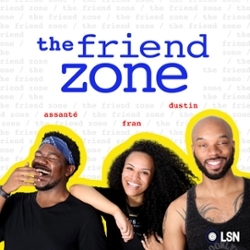 The course will provide an introductory investigation of historical and contemporary African American tropes visible within these areas: chattel slavery, film, television, sports, comedy, music and politics. 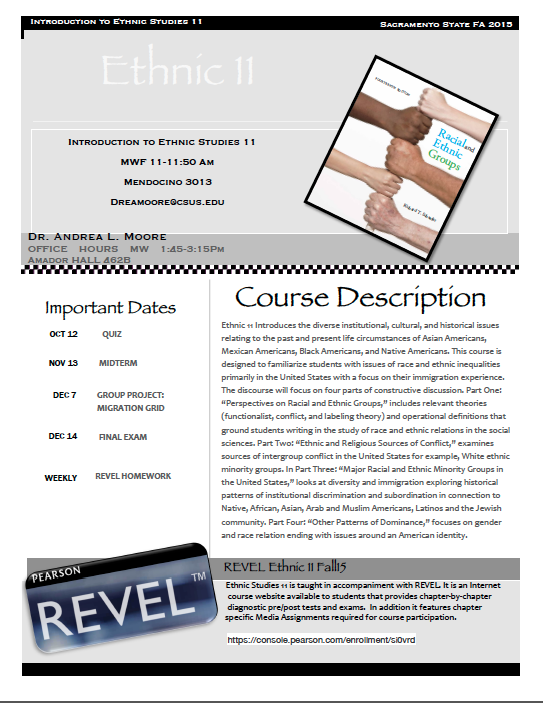 The course will integrae racialized gendered stereotypes emphasizing the relevance of intersectionality within the consumption of African American culture. This course is designed to introduce students to issues of race and ethnic inequalities primarly in the United States with a focus on immigration experience. 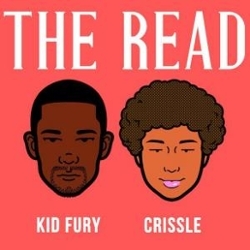 Through an interdisciplinary approach, the construction of race and four major American ethnic groups-Black, American Indian, Chicano, Asian American become the focus.